House, 5 Bedrooms, 4.5 Baths, btwn upper/lower village montecito,close beach. Enjoying one of the most spectacular and breathtaking views, this gated private oasis overlooks the ocean, the beaches, and the Channel Islands. Situated in the foothills of Montecito, this home lies between the upper and lower village. A stunning, spacious, comfortable house built on one level, designed for indoor/ outdoor living with a newly refurbished pool and hot tub ( 2018). Just a few minutes away from the restaurants, and shops of Montecito and yet close enough to hop on the freeway and enjoy down town Santa Barbara. Three of Montecito's golf clubs, and butterfly beach by the Four Seasons Biltmore and San Ysidro ranch are but a five minute drive. Beautifully decorated and consistently described by guests as wonderfully comfortable and manageable, this home is the perfect spot to create life long memories. An antique gateway opens to reveal a beautiful home surrounded by an expansive terrace and entertainment area, the focal point of this house. Well furnished with chaise lounges, comfortable sofas and an olive-shaded eating area, the long terrace overlooks the lush terraced gardens and pool area. It is the perfect place to spend time enjoying the expansive views, sipping sundowners or having brunch with friends and family in Santa Barbara’s temperate climate. Inside, original paintings by European artists, antique Moroccan and Mexican doors and terra-cotta terazza floors abound. To the right of the entrance hallway is the formal dining room, where one can dine surrounded by breathtaking paintings and one-of-a-kind antiques. Just beyond the dining room is the large formal living room, with all of the creature comforts, including a working fireplace, 2 long couches. a high end geneva ipod cd player and an abundant and eclectic collection of books and DVD’s. Leading off both these rooms is the large terrace with a retractable awning overlooking the ocean. Entertaining inside and out is the way this house was designed to be enjoyed, in true California style with a european sense of flair and comfort. The dining room and foyer lead into the gourmet kitchen area and great room. The great room features 14-foot vaulted ceilings and offers a space every one can enjoy. It contains a seating area and a large flat screen television with Blue-Ray player and hundreds of DVD's for all ages The dining area within the great room seats 10 guests comfortably. The house has been furnished with 12 place settings: wine glasses, plates, cutlery. The great room leads to the back of the house which is terraced with various entertainment areas. This quiet private rear garden has a barbecue,a raised quiet sitting area, a lawn, 2 chaise lounges, and a basketball hoop. There is also a flat path that leads around the house to the front garden and pool area. Both the Great Room and the adjoining gourmet kitchen are exceptionally well equipped as the owners are passionate about great food and easy entertaining. The kitchen is stocked with any and all conceivable top-of-the-line large and small appliances. Dacor double oven, viking range, large subzero Fridge/ Freezer ( 2018) , 2 dishwashers ( Miele.Bosch 2016) , bar fridge, 2 prep areas, compactor pots and pans, knives, and all utensils etc etc. A large skylight illuminates the kitchen during the daytime, showcasing granite counter tops, and a sizable island. The master suite is the absolute ideal of style, relaxation, and luxury. There is a king-size oriental-style four poster bed. French doors lead onto its own private patio with a truly extraordinary ocean view. The Patio staircase take you on your own path to the pool and Jacuzzi. The master bath contains dual sinks, a large tub, a TV, a sitting vanity area, private toilet, and glass-enclosed shower. Leading off it is a dressing room/ walk through closet. All of the bedrooms have pillow-top mattresses ( 3 new 2018), high end european comforters and beautiful linen. Our guests constantly comment on the quality of the beds and the fabulous nights sleep they get. 2 guest rooms ( new refurbished bathroom 2018) on the far end of the house are situated just beyond the master suite, both have private entrances to the back patio area. This additional master has a california king bed and the other guest room is equipped with a queen four poster bed and walk in closet. Both rooms can be closed off from the rest of the house, creating a two-bedroom suite or private second master. These guest rooms share a roomy bathroom with a Jacuzzi tub and separate glass-enclosed shower. Two additional suite-style bedrooms are situated past the kitchen/great room area. One has a Queen size bed, en-suite bathroom with jacuzzi tub and shower, a walk-in closet, looking onto the rear garden. The other has a bathroom with shower, flat screen TV and twin beds looking onto the sea view. There is a separate Laundry room. And a separate powder room. In addition to its stunning views, luxurious, comfortable furnishings and abundant amenities, the residence has an excellent housekeeper, who comes once a week to tidy the house. The house is also well managed by a team who have been working there upwards of twenty years. You will be met by either ourselves or our property manager. And someone will be available to you throughout your stay if you have questions. This is a well oiled machine! We had have had many happy guests return throughout the years. We work hard to maintain our home to the highest standard. This house is under five minutes drive to the excellent shops, restaurants and beaches of the upper and lower village of Montecito. Public tennis courts are just two minutes from the house. The three golf courses of Montecito, are but a five minute drive. Downtown Santa Barbara is three exits away on the freeway. Santa Barbara has three excellent movie theaters, two live theaters, shopping malls, a huge variety of restaurants, bars, nightclubs, jazz clubs, museum etc etc etc. The renowned wine district of saint Ynez is just 30 minutes drive. Six Flags Magic Mountain is under an hour. The outlets are 20 minutes. Malibu is 40 minutes, Beverly Hills, Hollywood and Universal studios are 90 minutes. We are served by two airports, an excellent small accessible local airport just 15 minutes away with all of the rental car companies and good taxi service. LAX is a 90 minute drive and is served by a frequent air bus as well as all of the usual amenities. Please, no parties or events of any kind. However extra housekeeping, a personal chef, personal trainers or drivers, can be arranged. Please view our video and all photos, these are current (2019) so are an accurate representation. There are no viewings pre booking this residence, no furniture can be moved when renting this property, without prior negotiation. Occupancy strictly 10 max. If you wish to have a chat, our company, Brainstorm Creative Santa Barbara, is easily found, as is my name, Richard Weston-Smith. We strive to make our home as comfortable for both ourselves and our tenants. And with that objective, we are constantly upgrading to ensure the best stay possible. My wife and I wanted to find a place with a perfect year round climate offering the best of the US and Europe. We love the ocean, outdoor pursuits, culture, great restaurants, proximity to everything and easy parking! Our three children who are now working and leading their own lives have enjoyed an idyllic childhood in this beautiful home. We want every guest who uses our home to feel as comfortable and relaxed there as we do. Location is everything, this home is nestled between the upper and lower village of montecito. Close to all of the amenities, shops, restaurants, and beaches, The Four Seasons Biltmore, The new Rosewood Miramar, Butterfly Beach, the bird Sanctuary, Montecito Country club. Valley and Birnam Wood Country clubs. With down town Santa Barbara just ten minutes drive away. This is our home. as well as a vacation rental when we are away, so it is in a different league from most vacation rentals. Exceedingly comfortable, beautifully furnished with high quality finishes, european bedding, a gourmet kitchen and much much more. We are constantly upgrading and maintaining our home. Recently adding a new remodeled bathroom. New sonos sound system, new TV in the family room. New very large sub zero etc etc. This home is all about the beautiful view. Why be on the ocean if you can’t see the ocean? Bug free, with a beautiful ocean breeze year round, the nights are cool enough to sleep with out air conditioning. Days that are warm enough to enjoy..... Its a perfect location for a vacation. btwn upper and lower village montecito, close to butterfly beach, and all 3 golf clubs. seven minutes drive to downtown santa barbara, scenic drive along the riviera to famous santa barbara mission. Santa Barbara has long been known as one of the most beautiful year round resorts on the west coast. Close enough to Hollywood, nestled close to vineyards and mountains and long sandy beaches. overlooks the beaches and the islands. closest beach butterfly. Santa Barbara is well known for great golf courses. above montecito country club, and around the corner from Birnam Wood and Valley club. most people use their own cell phones. Sub Zero, 2017. Brand new. Cuisinart K-Cup coffee machine and French Press, Kettle for tea! Very well stocked, both for inside and outside. we ask that everyone uses the attractive plastic plates and glasses when by the pool for safety reasons. seating for 10 in the family room. And on the terrace next to the bar b que. ( please leave the bar b que clean and gas canisters full). yes, attach to the iPhone. yes. We have an extensive collection of DVDs of past collection from the oscars. We do ask everyone to be sure to leave them in the house for everyone to enjoy. yes small for children to play . The entire house is wheelchair accessible, as well as the pool area. 2 MASTER BEDROOMS, KING BEDS. All of the bedrooms have exceptionally comfortable beds with beautiful linens, 2 dish washers, compactor, viking, dacor oven, very high end chefs kitchen, maid service once weekly. Completely enclosed private property, Pool is not fenced, not suitable for young children. All children should be supervised.there are 2 pathways to pool, one steps and one flat wheelchair access. Every full bath is a jacuzzi. Wonderful place for a family or group. Grounds are expertly landscaped and you have a terrace view of the Pacific. Richard was an attentive and welcoming host. The owners have a tremendous collection of eclectic art and furniture. Very comfortable and I would highly recommend! My family and friends rented Richard's place for a nice getaway. We enjoyed the scenery and the energy of the home was fantastic. Very comfortable and accommodating. Would definitely stay here again with my family. The Montecito estate is simply a gorgeous home with stunning views over the Pacific bay. The house has wonderful flow, the rooms are all individually decorated with the most eclectic doors to discover. It was so lovely to find shower gels in all the bathrooms and the kitchen had coffee and tea and basics to get you started. Montecito village is just minutes away, the harbour is a ten minute drive, with great sunset views and excellent restaurants to discover. We fell in love with this home, which has a fab Sonos system, access to lots of up to date movies and a secluded swimming pool with adjoining hot tub. Privacy guaranteed, rest and relaxation easily achieved. Richard replied promptly to any queries before we arrived and Kiana welcomed us and answered any questions once we had settled in. Many thanks! It is always great to know that we have helped create memories you will look back on with joy. The house does have a wonderful feel to it for a family holiday! Many thanks and we hope we will be able to welcome you again in the future. With best regards, Richard & Kirsten. Everything we were hoping for was provided to us by this property and its gracious owner. We have no hesitation giving this unqualified recommendation. We had a most delightful 51/2 weeks at this Montecito Paradise, combining work and vacation. We wanted to retreat from the winter back east and have always loved Santa Barbara and we were not disappointed! Every morning we awakened to the most gorgeous view of the ocean and Channel Islands. Breakfast, lunch and dinner on the lovely patio that extends the length of the home was always so delightful. Plus we had fantastic weather. The house spreads out perfectly so that when friends and family visited, everyone had their own space. The pool and hot tub were enjoyed by all. The enchanting terraced gardens were beautiful and invigorating. We loved how everything was so convenient such as Vons Grocery and Trader Joe’s just minutes away, making the nearby shopping stress free. And speaking of stress free, the cooking in the lovely, well equipped kitchen was more than easy. There were plenty of restaurants to choose from but we didn’t want to leave the view or the lovely gardens. It truly was R and R in a wonderfully secluded location. Trust us, you won’t want to leave! It was a treat to meet Richard, the owner, who responded immediately to any questions or concerns before we arrived and during our stay. He was the best! We hated to say “good-bye” to what became our “home away from home!” Thanks Richard for the memories that we hold dear. 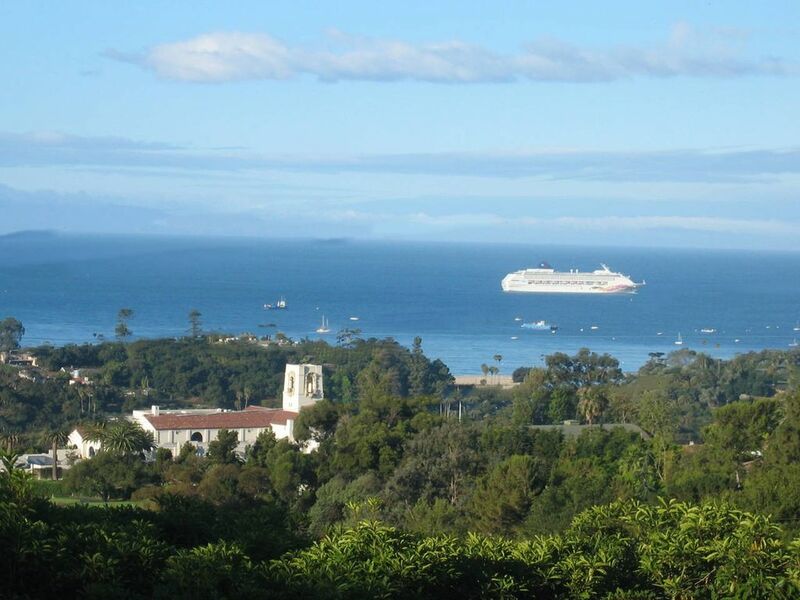 We are grateful for the gorgeous pictures we have to remind us of our “warm winter” in Montecito. We loved every minute! This property is not to be believed! From the moment we first met Richard, we knew our stay would be an amazing experience. The house itself is beautifully decorated, but the view is truly second to none. The view of the ocean is awe inspiring, and we loved just sitting out on the well appointed patio. We took long walks around the neighborhood amongst multi-million dollar homes, and it is a just a short drive into the Upper Millage of picturesque Montecito. It was the best way that we could have imagines to spend a month. We look forward to returning again and again! private road, gated property, between upper and lower village of montecito. very close to shops, restaurants, butterfly beach and bird sanctuary, zoo, harbor all close.. down town santa barbara 7 minutes on freeway. wine country twenty minutes away. Outlets 25 minutes. Six Flags Magic mountain, 45 minutes, Malibu, 40 minutes, Beverly Hills, Hollywood, Universal 90 mins. , Public tennis courts two minutes from the house, private, gated. House manager always available to guests. Experienced team worked in house for 22 years, housekeepers, garden, pool, maintenance. Tried and trusted, Chefs, trainers, drivers, baby sitting service all available on request. no viewing all photographs and video recent and accurate 2017. please review. July 1st to Sep 30th is High Season, as are rentals that fall over Thanksgiving and Christmas. During high season, full payment is required 90 days in advance, with a 90 day cancellation policy. Special rates apply for holidays etc. please enquire. A daily fee of $21 will be charged to cover the midweek visit by our housekeeper (VRBO does not let us specify a weekly housekeeping fee). Most holiday weekends are 3 day minimum. Credit card payment fees will be paid by guest.